Notice: 2 adults are included in the basic charge. Up to 1 extra adult can be accommodated in this room at Php 1,000 per night. Charge is payable at the hotel. In the midst of a thriving leisure and luxury center in the City of Golden Friendship, Limketkai Luxe Hotel stands out with a golden all-glass façade that signifies both the comfort and elegance you can expect from this hotel. This property does not need a five-star rating to establish itself as a landmark that speaks for the true Cagayan De Oro essence. They translate this vision into reality by giving extraordinary service to their guests since 2013. All their stayers are provided with the best of Kagay-anons hospitality with their sweetest smiles and heartfelt gestures, first-class facilities, and of course, sophisticated accommodations at Limketkai Luxe Hotel. If you are looking for an accommodation that offers excellent accommodations and services, look no further and book a stay at Limketkai Luxe Hotel. Their elegant exterior definitely matches the kind of luxury you’ll experience at this hotel. With their well-appointed rooms, convenient services, and modern facilities, one will surely experience authentic Kagay-anon hospitality at its best. 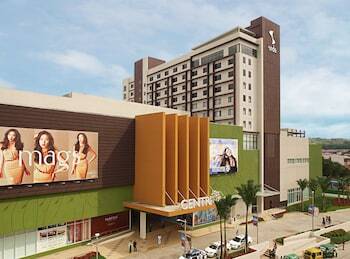 Hotel is located at centrio mall within 15 to 20 minutes by jeepney. The property is a 45 minutes drive from Laguindingan International Airport either by car or taxi. "enjoyed the stay in the hotel"
I really love the customer service in the hotel because the staff are very accommodating. They see to it that our stay will be worth it especially we have our baby. They offer their crib and made our bed a queen size. The room is clean and the bed is so soft. All the facilities are functioning well. We will recommend this to our friends. We will book again. Overall service is topnotch. Great food and close to nearby offices and facility. Ambiance was superb. Evert time i visit Cagayan De Oro i Always spend one night or Two in this hotel with My girl friend and My Two daughter, We like here because they have swimmingpool, sauna and gym.